The first is the fact that people must want to enter in order to 'win' - this sounds obvious but no competition can hope to declare the 'best' of anything you have to enter, usually through 'fee', in order to be included. The second is that photography as an art can have no 'winner'. A photograph or photographs can be selected as 'best' by a group of people but in most competitions, one bunch of people judge the first round and then a completely different set of people come and judge the second round bringing with them different perspectives on photography - where's the consistency in that? Now there is nothing intrinsically 'wrong' about either of these things - a competition is what it says on the tin and you enter at your own risk. However, I've been thinking about a better way of dealing with the issue of recognising great landscape photography for some time and after consulting quite a few other photographers we've decided to go public with our ideas and have a 'launch'. Well, it's probably obvious from the title that we're talking about an award here rather than a competition. What does this mean then? Well, the first thing it means is that you don't have to enter - our judging team can give the award to someone who doesn't even know about our magazine. The idea of the award is that is doesn't exclude anyone and hence has the scope to recognise any photographer. The next thing we wanted to address is the cult of the single image. Just as you wouldn't judge a chef by a single dish, we don't think judging a photographer by a single photograph makes any sense and so we wanted to look at a group of images. The number of images is difficult but we came to the conclusion that four would probably be a good balance between enough to recognise consistency in a photographers output and restricting the amount of images our judges would have to look at. The question you might be asking is, if you don't have to enter, how do we find out about you? Well, you can enter - it's just not necessary. And you can also recommend another photographer - you don't have to pick four of their photographs, we'll happily pick a set, but if you want to you can show us what you think works well. Another question. Won't the first year be the fairly predictable 'best' photographers who publish books etc? Well, our 'brief' for our judges will be fairly loose. We'll be asking for originality, composition, narrative, etc and each judge will have their own quite strong opinion on what makes for great work. 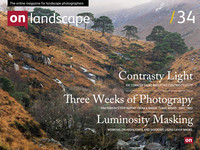 On top of this, we will have a section for 'contributions' to landscape photography. We would expect this to include some of the famous names along the way. Who'll be judging it? Well, the first judges will be people connected with the magazine in some way, myself (Tim Parkin), Andrew Nadolski, David Ward, Rob Hudson, Joe Cornish and a couple more to be confirmed. Next year we'll feature some different judges to keep the variety of results moving. How are you judging? We'll be looking at various things but originality, creativity and technical excellence will be factors. As will the consistency across the images chosen. Each judge will get to select his or her favourite and then there will be two or three group selections. We'll be keeping things as open as possible in order to ensure that the final set of awards makes sense and shows a great cross section of landscape photography. Who can enter? For the first year we're going to limit this to pictures of Great Britain from British photographers - it would be unfair with the cross section of judges to do this differently. If all goes well however, we fully intend to open this up and try to extend it internationally as long as we have the resources to do so. And what does being selected entail? We hope to be able to have a small exhibition of the selected awardees and a permanent section of the website dedicated to the awards which will do the photographs and photographers justice. There isn't any money involved but we're hoping that being recognised by your peers is reward enough. If you want to make us aware of your own work or to recommend others, you can send your nominations to 'awards@onlandscape.co.uk' and include the name of the photographer as the subject of the email and a link to the four images you have chosen in the body of the text. Feel free to add some text to explain why you nominated them if you like. We'll publish nominations on the website in the coming months. We'd love your feedback on this as our goal is to build an award that the landscape photography community can be proud to take part in and that represents the qualities we all strive for.